POEMS: "That time of the year"
Bobby was getting cold, sitting out in his back yard in the snow. Bobby didn't wear boots; he didn't like them and anyway, he didn't own any. The thin sneakers he wore had a few holes in them and they did a poor job of keeping out the cold. Bobby had been in his backyard for about an hour already. And, try as he might, he could not come up with an idea for his mother's Christmas gift. He shook his head as he thought, "This is useless, even if I do come up with an idea, I don't have any money to spend." Ever since his father had passed away three years ago, the family of five had struggled. It wasn't because his mother didn't care, or try, there just never seemed to be enough. She worked nights at the hospital, but the small wage that she was earning could only be stretched so far. What the family lacked in money and material things, they more than made up for in love and family unity. Bobby had two older and one younger sister, who ran the household in their mother's absence. All three of his sisters had already made beautiful gifts for their mother. Somehow it just wasn't fair. Here it was Christmas Eve already, and he had nothing. Wiping a tear from his eye, Bobby kicked the snow and started to walk down to the street where the shops and stores were. It wasn't easy being six without a father, especially when he needed a man to talk to. Bobby walked from shop to shop, looking into each decorated window. Everything seemed so beautiful and so out of reach. It was starting to get dark and Bobby reluctantly turned to walk home, when suddenly his eyes caught the glimmer of the setting sun's rays reflecting off of something along the curb. He reached down and discovered a shiny dime. Never before has anyone felt so wealthy as Bobby felt at that moment. As he held his new found treasure, a warmth spread throughout his entire body and he walked into the first store he saw. His excitement quickly turned cold when the salesperson told him that he couldn't buy anything with only a dime. He saw a flower shop and went inside to wait in line. When the shop owner asked if he could help him, Bobby presented the dime and asked if he could buy one flower for his mother's Christmas gift. The shop owner looked at Bobby and his ten cent offering. "You must wait here and I"ll see what I can do for you." As Bobby waited, he looked at the beautiful flowers and even though he was a boy, he could see why mothers and girls liked flowers. Bobby's heart sank as the owner picked them up and placed them gently into a long white box. "That will be ten cents young man," the shop owner said, reaching out his hand for the dime. Slowly, Bobby moved his hand to give the man his dime. Could this be true? No one else would give him a thing for his dime! Sensing the boy's reluctance, the shop owner added, "I just happened to have some roses on sale for ten cents a dozen. Would you like them?" This time Bobby did not hesitate, and when the man placed the long box into his hands, he knew it was true. Walking out the door that the owner was holding for Bobby, he heard the shop keeper say, "Merry Christmas, son." As he returned inside, the shop keeper's wife walked out. "Who were you talking to back there and where are the roses you were fixing?" Staring out the window, and blinking the tears from his own eyes, he replied, "A strange thing happened to me this morning. 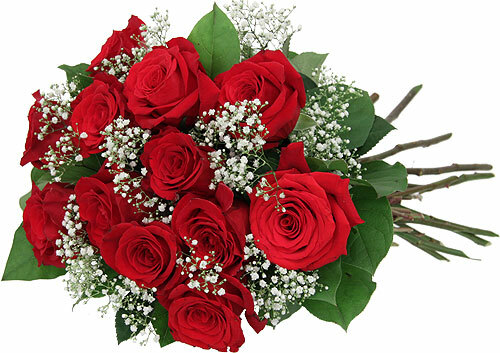 While I was setting up things to open the shop, I thought I heard a voice telling me to set aside a dozen of my best roses for a special gift. I wasn't sure at the time whether I had lost my mind or what, but I set them aside anyway. Then just a few minutes ago, a little boy came into the shop and wanted to buy a flower for his mother with one small dime. When I looked at him, I saw myself, many years ago. I too, was a poor boy, with nothing to buy my mother a Christmas gift. A bearded man, whom I never knew, stopped me on the street and told me that he wanted to give me ten dollars."